The Shure PG58-XLR Dynamic Mic with XLR Cable is an affordable, high-output dynamic mic that offers rock-solid performance for backup and lead vocals. Features neodymium magnet, internal shockmount, pop filter, and on/off switch. Cardioid pattern rejects noise and minimizes feedback. Frequency response: 60Hz-15kHz. 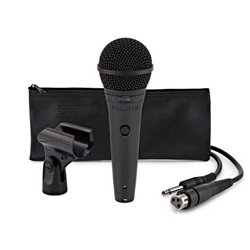 The Shure PG58-XLR Dynamic Mic with XLR Cable includes 15' XLR cable, clip, educational guide, and storage bag.